In this tutorial I will explain how you can use VueScan to calibrate your scanner and produce a bespoke film ICC profile. This will improve the accuracy of your colour film scanning. It’s something a specialist will charge you a lot of money for, but with a little knowledge and a few tools you can easily do this yourself. As you may already be aware, I rate the VueScan scanner software very highly. Not only does it produce excellent quality scans, it will also work with old scanners where drivers for the latest operating systems might no longer available. Whilst this alone makes it good value for money, it also includes some very useful colour management features. If you don’t already have VueScan you can download a demo version from the Hamrick website. Before we start, it’s helpful to understand a little bit about colour management and why it is necessary. When a scanner captures colour information in an image it does so using three colour channels, red, green and blue. These three colour channels represent the colours in the image. By combining the three channels in varying proportions we can create many different colours. For example, an RGB value of 255, 0, 0 is maximum red (255), no green (0) and no blue (0). This colour would appear as a bright pure red to the scanner. In an ideal world it would also appear on the screen and printer as the same colour. Unfortunately, theory and real life don’t quite work the same. Equipment can vary as can factors such as film and paper. In the end, there are so many variables that it’s a wonder your prints look anything like the film you scanned in. Whilst this article can sort out your scanner calibration, if you’re going to be printing your scanned photos you should also ensure you’re soft proofing your prints correctly. When we calibrate our scanner correctly, we ensure that colours of the film translate accurately into the digitised photo. Importantly, you can reply on this image file as having the correct colours. If you find they don’t look right when viewed on your monitor, it’s most likely the monitor calibration is at fault. When complete, the scanner calibration process produces an ICC file. 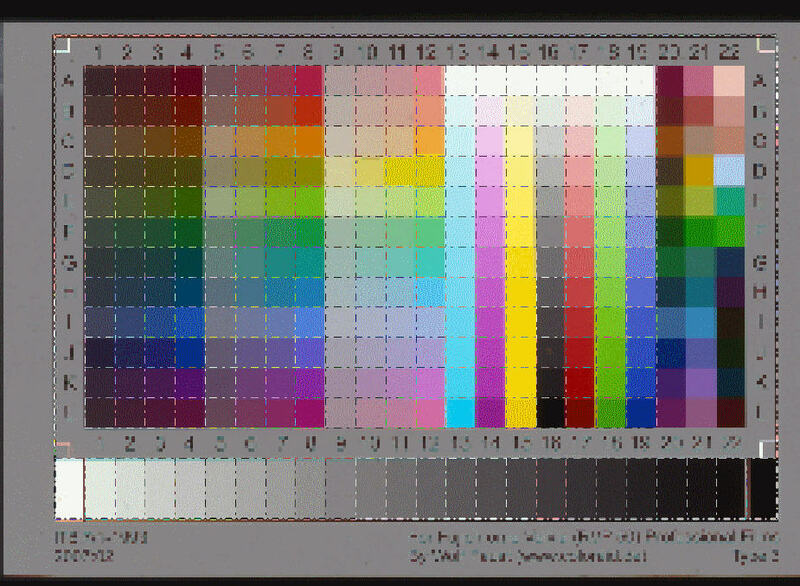 Your computer and scanner software then use this to ensure colours are accurate. As every scanner (even the same make and model) will vary in how it reproduces colour from a scan, we need to start from a known set of colours. This is where the colour calibration target comes in. There are different types of scanner target, but all follow the same principles for use. Each target should also come with a data file containing information that describes each colour in the target. You can see an example in figure 1 below. If you don’t currently have a calibration target and data file you will need to purchase one. These can be expensive however I have found www.coloraid.de to be an excellent source of cheap high-quality targets that are a fraction of the price of the same Fuji or Kodak targets. I should also mention that each type of film also needs its own target and calibration data as all are slightly different. This means that if you intend to scan a Fuji Velvia slide you will need to scan it with an ICC profile created from a Velvia calibration target etc. In the Input tab in VueScan select the “Task” as “Profile film”, “Source” as your scanner and Mode and Media to match what you are scanning e.g. Slide Film if your calibration target is a slide. You can see how I have my software set up from Figure 2 below. I also tend to set the “Preview resolution” to 800 or 1600 pixels (not shown in this illustration). It makes working with the calibration overlay in step 8 much easier. On your “Color” tab set the “Color Balance” option to “None”. This prevents the software from making any adjustments prior to creating the ICC profile. This step probably isn’t necessary, but I like to do it to be on the safe side. When I purchased my calibration target I received the calibration data as a text file on a CD or DVD. Depending on where you purchase your target you may be able to download the data file from a website. Copy this data file onto your hard drive and make a note of the location. I tend to copy mine to the VueScan folder. In the VueScan “Color” tab set the “Film IT8 data” to be the file you copied. Once you are ready, click the “Preview” button to start. A preview scan is prepared and VueScan will display a grid like overlay on top of the preview. Resize your overlay to match the preview of your slide. This might also require you to rotate the image until you can get the two to match and line up. An example is show below. Select “Profile | Profile Film” from the menu. VueScan should respond with a message telling you that it has created an ICC file. Find this file on your hard drive (it will probably be in the c:\vuescan folder) and then move it into the folder where you will store your profiles. As VueScan creates the profiles with the name specified in “Film ICC profile” box (see step 11 below) you should rename the ICC file to the type of film that you have just profiled e.g. Velvia. Take care that when making new profiles you don’t overwrite existing ones. In the “Color” tab select the “Film color space” drop down to be “ICC Profile” if it isn’t already. Next set the “Film ICC profile” to be the location of the file you created in step 10 above (just remember to clear this before you make your ext profile). Finally in the “Film ICC description” type a brief description of what this profile represents e.g. “Fuji Velvia ISO50”. This is just a description so that you realise how the scanner is calibrated. You are now ready to start scanning your films with a calibrated scanner. Also remember that your equipment can vary over time so I would suggest repeating the above at least every 6 months to produce a new calibration. Having followed the steps above you might still not be happy with the scans you produce when you view them in your image editing software. This could be because whilst your scans are calibrated your monitor isn’t. This could make colours like white appear to have a blue or red tint. If this is the case then you should also calibrate your monitor. In truth I would recommend calibrating your monitor on a monthly basis. The best way is to use a dedicated tool such as X-rite i1 which is what I use. There are much simpler and cheaper alternatives such as EasyRGB which can be accessed on the Internet. Check out the link in the Resources section of the Lenscraft web site. If you follow the steps in this tutorial you should be able to produce consistently web balanced images from your scanner. If you want to find out more about colour management you might wish to review my book Essential Colour Management. To improve the quality of your scanning further please read my tutorial "Better Film Scanning". The advice in this tutorial can significantly improve your film scanning. Thank you – to clarify: for say Fuji Velvia 50 (slide) I will carry out the same operation as above but instead of film profiling will be setting it to scanner profile? If I understand what you are trying to do, yes. The Film Calibration in VueScan is used to calibrate for colour negative. Use the Scanner Calibration with either scanner targets or slide film targets. I have though tried the slide film targets for both scanner and film calibration and it appeared to work. That was though quite a few years back and there has been a number of VueScan iterations since. Thanks for an excellent article! This is the best information I’ve yet found that explains the whole process. It seems, however, that all of this only pertains to film and slides. Are there IT8 targets for paper documents and photos? Thanks for the positive feedback. To answer your question, yes you can profile for paper documents using a paper IT8 target. I believe you can buy them from http://www.targets.coloraid.de/ although I’m sure there are other sources if you search for them. How about scanning color negative? Is there a color negative target or can a color slide target be used? What is the difference between Profile Scanner and Profile Film in Vuescan? Scanner profiling is the process of calibrating your scanner to produce accurate colour when scanning a positive image, for example slide film. The VueScan film profiling is for negative film and is to help you get accurate colour scans from negative film. When scanning colour negs it can be difficult to achieve accurate colour. To do this you will need to take a picture of an IT8 target using the colour negative film you want to profile. Once you have it developed, you would scan it and then use the original IT8 data file from the target to produce the profile. Hope this helps. True, but then they are much easier to correct than colour slide film. Not sure if you have already tried this but scan to a DNG file and it makes working with Black an White easier. Here is an article I did on the subject. Don’t be confused by the title as the principles are the same.